NAMI New Jersey welcomes volunteers! Over the years, we have benefited from the skills and talents of volunteers who have helped with program design, outreach, publications, website design, administrative work and a host of other tasks. Volunteers also leave with a new found appreciation of NAMI NJ programs of support, education and advocacy. 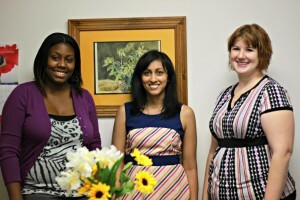 College students and recent graduates have served as interns, working with our major programs such as NAMIWalks. High school students have helped with administrative tasks, outreach and special events, and have received community service hours for their contributions. Those who would like to volunteer at our NAMI NJ Office, located in North Brunswick, are invited to fill out the NAMI NJ Volunteer Application Form and email a resume to volunteers@naminj.org. If you are interested in volunteering within your county, visit our local affiliate webpage.